Theme: "Are We There Yet?" The Krewe of Alla, which was established in 1932, is proud to announce that it welcomes women to join the organization. Its board of directors has adopted Bylaws that remove the krewe’s all-male distinction, which it held for 82 years. It is anticipated that Alla will draw couples and families (children age 16 and older) who want to join in the merriment and fellowship that Carnival clubs offer. The Krewe of Alla was formed November 19, 1932, and was originally sponsored by the West Side Carnival and Social Club, Inc. The group was reorganized July 26, 1977 as the Golden Gryphon Society, Inc. Since its formation, the krewe has staged a total of 75 annual street parades, one 75th anniversary parade, one Gretna Kick-Off parade, and 11 river parades. Due to World War II, Alla did not stage its annual street pageant for the years 1942 to 1945. In 1968, the parade was postponed twice because of inclement weather, and was cancelled for an entire season. 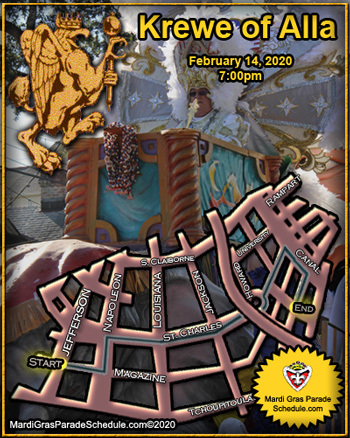 The Krewe of Alla will parade on Sunday, February 24, 201, at 2:00 p.m. on the Uptown New Orleans route. It will begin at Magazine and Jefferson, proceed on Magazine to Napoleon, turn left and proceed to St. Charles Avenue; turn right and proceed on St. Charles Ave. to Canal Street, where it will proceed to the New Orleans Convention Center. The Krewe of Alla is known for its bright, beautiful floats designed by Blaine Kern Artists, Inc., its outstanding bands and marching groups, and generous riders whose throws please paradgoers. In 2014, Alla moves from its tradition Westbank route to the St. Charles Ave. Route in Uptown New Orleans. The Krewe of Alla was formed in 1932 with only 35 members. In 1978 the Krewe reorganized as the Golden Gryphon Society, Inc. The Krewe of Alla celebrated it's 75th year in 2007 with 550 members.They put on their biggest and most spectacular parade on the streets with the most talented local and out of state bands. The Krewe of Alla, carnival's fourth oldest parading group, was founded by the Westside Social and Carnival Club, and presented its inaugural parade with a single float on Fat Tuesday, 1933. The 500 member, all male krewe takes its name from an abbreviation of Algiers, Louisiana - the New Orleans West Bank community through which it travels. Alla staged 10 river parades and nearly 30 tableau balls at the Municipal Auditorium before reorganizing under the auspices of the Golden Gryphon Society in 1978. Alla's king and queen are called the Maharajah and the Maharanee. Alla tradionally presents the largest parade on the West Bank.